New Years Eve 2009 was the first Blue Moon in 20 years and this is the story of how I was able to make it an especially memorable night for me and Amber, the woman I love. I proposed to her and it was a pretty special adventure for us. It was a very exciting time and of course half of the adventure was in the preparations. Next on my agenda was trying to make sure that we would have a fun, light hearted, yet memorable night. I was a little nervous as to how I would plan a fun packed evening without giving away the fact that it was going to turn into the night of my proposal. A few months ahead I started talking about how I really wanted to make a real date night for Amber and I the next time I visited. (Amber and I live 9 hours away currently) Although we had gone out many times together, we had never in my opinion, had a real “great date night”. I intended to fix this, I told her. She agreed to let me plan a “great date” for us and I told her our plans were for New Years Eve. I talked with several close friends before the date and asked their advice and one piece of advice stuck with me the most. ‘Plan the night, but not the proposal, just let it happen at a moment that is really fun and reflective of your relationship’. This really made sense to me and I kept it in mind as I planned the evening and planned on looking for the most opportune time to “pop the question”. 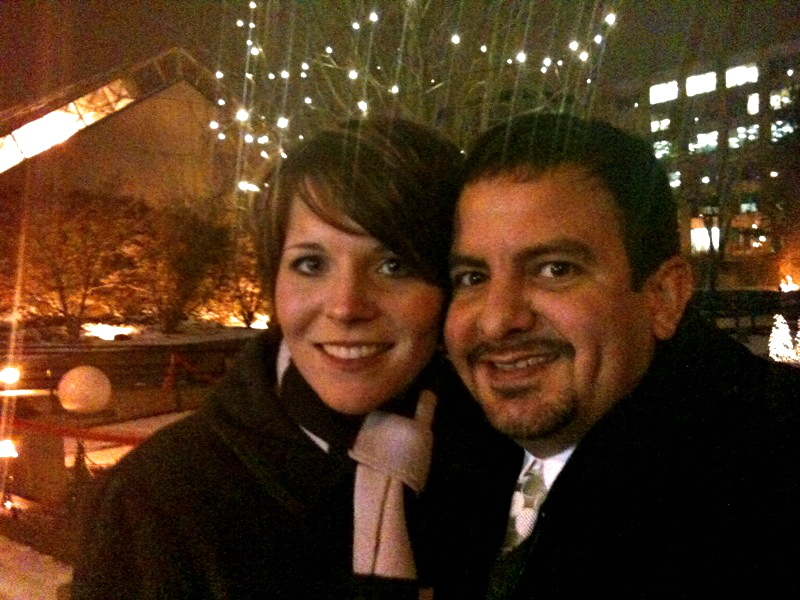 The evening started out with us going to Headwaters Park to go ice skating. Walking in and finding that it was ‘cash only’ and that I had none seemed to be just the perfect start I was hoping for. We headed back to the car and were off to an ATM to get some green. Having paid, we headed out to get our skates and our bruises. Surprisingly neither of us ever fell as we talked about some of our favorite and most memorable times over the past year. Not wanting to press our luck and end up on our keesters, we headed out to our second stop of three for the evening. Fort Wayne’s Botanical Gardens was our next stop. Inside there were Christmas displays, a tropical display, and a southwestern display. As we walked through we talked about dreams for the future and what kinds of stories we’d like to be able to tell in the future. Outside there were some metal artwork displays along with a courtyard full of Christmas decorations. Music was playing and the the lights danced along to the music. I noticed that it was snowing and the the courtyard was covered with snow and that it was beautiful. I thought that maybe this would be the time. What happened next only confirmed my suspicions. Amber busted out doing some goofy dances that were references to some of our favorite TV shows. (It’s Always Sunny in Philadelphia & Arrested Development) This had to be the moment. It was silly and funny and yet beautiful. Those are definitely words most would use to describe our relationship. At this point Amber was in a state of disbelief, excitement, shock, and confusion. She looked at me and said, “Are you serious? Is this real?” Eventually she gave me the answer I was looking for and with enthusiasm said “Yes! Please get up!” After several minutes of explaining how I had pulled all this off without her knowing we headed out to dinner at Eddie Merlot’s and then to our close friend’s house for a cozy New Year’s Eve party. So that’s how it happened, as best as I can remember at least. Amber says she never heard me ask her to marry her and didn’t see the ring until I stood up, but this is my side of the story and I’m sticking to it. Sorry that this entry is a little sappy compared to most, but I figured it was a special occasion and that it would prove to be helpful to keep the memory alive if written down to share with others. May we all enjoy moments that only come “once in a blue moon” a little more often. Izzy, I’m so happy for you and Amber. I know God will bless you and bring you through every obstical. I believe your wedding day will be the best day of your lives. I couldn’t be happier.